Not to be confused with Bolus (disambiguation). For other uses, see Bolas (disambiguation). Look up bolas in Wiktionary, the free dictionary. A bolas (plural: bolas or bolases; from Spanish bola, "ball", also known as boleadoras) is a type of throwing weapon made of weights on the ends of interconnected cords, used to capture animals by entangling their legs. 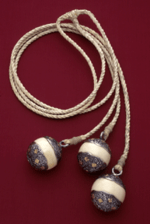 Bolas were most famously used by the gauchos (Argentinian cowboys), but have been found in excavations of Pre-Columbian settlements, especially in Patagonia, where indigenous peoples (particularly the Tehuelche) used them to catch 200-pound guanaco (llama-like mammals) and ñandú (birds). The Mapuche and the Inca army used them in battle. Researchers have also found bolas in North America at the Calico Early Man Site. Gauchos use boleadoras to capture running cattle or game. Depending on the exact design, the thrower grasps the boleadora by one of the weights or by the nexus of the cords. He gives the balls momentum by swinging them and then releases the boleadora. The weapon is usually used to entangle the animal's legs, but when thrown with enough force might even inflict damage (i.e., breaking a bone). Traditionally, Inuit have used bolas to hunt birds, fouling the birds in air with the lines of the bola. People of a Feather showed Belcher Island Inuit using bolas to hunt eider ducks on the wing. There is no uniform design; most bolas have two or three balls, but there are versions of up to eight or nine. Some bolas have balls of equal weight, others vary the knot and cord. Gauchos use bolas made of braided leather cords with wooden balls or small leather sacks full of stones at the ends of the cords. Bolas of three weights are usually designed with two shorter cords with heavier weights, and one longer cord with a light weight. The heavier weights fly at the front parallel to each other, hit either side of the legs, and the lighter weight goes around, wrapping up the legs. 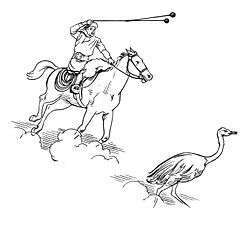 Other unrelated versions include qilumitautit, the bolas of the Inuit, made of sinew and bone weights and used to capture water birds. 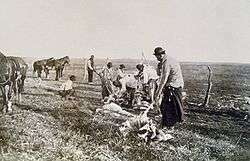 A group of gauchos hunting emus with bolas in La Pampa, Argentina. BOLAS is the name of a web application for targeted researching, saving & sharing sources in projects. The name is used as a metaphor. Bolas are a typical weapon of ninja and various warriors in several anime and comics. In the 1984 action-adventure, romantic-comedy classic Romancing the Stone, Elaine Wilder (sister of protagonist Joan Wilder) is intentionally incapacitated by bolas thrown by an apparently playing child. The boy then abducts Elaine, recklessly driving her red Shelby Cobra away, setting the plot in motion. In The Mercenary, the protagonist is knocked down in mid-run by two men on either side of him who simultaneously threw their bolas under his feet. In the 1979 Bond film, Moonraker, 007 checks in with Q at an MI6 base in Brazil where several weapons are being tested for near-future use. One of these is a bolas modified with balls that, once wrapped around a test dummy, explode on impact. A short time later, the exploding balls from the bolas (without cord) are instead used as mines during a river chase. The superhero Batman, in particular the animated version, makes use of bolas to ensnare criminals or trap supervillains. In some instances the bolas attach to a rope or line, permitting Batman to reel in the criminal after he has caught them, often leaving the criminal hanging from a height so the police can apprehend them with ease. In the comedy film Kangaroo Jack, Jessie (Estella Warren) helps Charlie Carbone (Jerry O'Connell) and Louis Booker (Anthony Anderson) construct their own aboriginal-style bolas and then trains them to throw and catch things with them. They fail to catch the kangaroo with the bolas, but in the end, Charlie uses his bolas to snag his nemesis, Frankie (Michael Shannon), and successfully foils his escape from Australian authorities. In Smite, the Mayan God of the Moon, Xbalanque uses bolas as his weapon of choice. In the Game of Thrones episode "You Win or You Die," the character Rakharo uses a weapon akin to bolas to apprehend a wine merchant who attempts to poison Daenerys Targaryen. In the Star Trek episode "Amok Time," the Vulcan weapon ahn-woon, consisting of a leather strip with weights at each end, is used to entangle the legs of a competitor in a Kal-if-fee battle. Rengar, a champion in a multiplayer online battle arena computer game League of Legends utilizes bola strike as one of his skills, to ensnare enemy champions. In "Though the Heavens Fall", an episode of the original Hawaii Five-O television series, a vigilante group use bolas to capture the criminals. In Never Alone, Nuna uses a bola to help her and the arctic fox traverse to break ice and activate spirits to help solve the puzzles found in the game. In James Cameron's Avatar, while Neytiri leads him back to hometree for the first time, Jake Sully is tripped with a bola thrown by the Na'vi hunters. In The Adventures of Sherlock Holmes (1939), used as a murder weapon by Prof. Moriarty's henchman. In The Hobbit: An Unexpected Journey, Dori uses a set of metal bolas as a battle weapon. In the Jurassic Park video game for the Super NES, the bola is one of the weapons available for the player character to use. In the Dreamworks film "How To Train Your Dragon," Hiccup builds a crossbow-like bola-throwing device in order to take down a dragon. In Far Cry Primal, Tankard uses bolas as his weapon of choice. In Ark: Survival Evolved, Bolas can be used to capture dinosaurs. In Dead Space 3, the player character can use a gun that shoots electric-charged bolas. In A Dark Room, the player's character can use bolas to stun an enemy and prevent them from attacking the player for a short amount of time. Bolas spiders, which swing a sticky web blob at the end of a web line to capture prey. ↑ Tracy Allard (8 November 2013). "People of a Feather (2011)". IMDb. Retrieved 21 November 2014. 1 2 Blair, Claude and Tarassuk, Leonid, eds. (1982). The Complete Encyclopedia of Arms and Weapons. p. 92. Simon & Schuster. ISBN 0-671-42257-X. ↑ "Inuit Bola". Gamesmuseum.uwaterloo.ca. Retrieved 21 November 2014. ↑ Archived July 9, 2008, at the Wayback Machine. Wikimedia Commons has media related to Bolas.